In this new startling book, Mr. Herold provides the most sophisticated insight, and shocking details about the current monetary system. Never before has the massive manipulation of money caused so much despair all over the world. 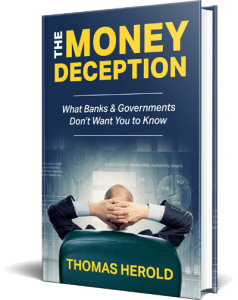 Uncovers and untangles over 20 legal methods used by banks, governments and cooperations that strip 95% of your income. Brilliantly written and astoundingly easy to understand. This book is an eye-popping exposure of the most sophisticated fraud in the history of mankind. Part two explains in detail smart and practical methods on how to shift from making money to creating real wealth. This money has been souped up by the 1% that now control 50% of the worlds wealth. The fastest and biggest wealth transfer in history is underway. Money evaporates, as quick as water in the desert, from the middle class, leaving them struggling and without hope for retirement. The elite class is celebrating their biggest heist with insane, astronomical profits. This is not going to last. Nevertheless the frightening facts, this book also provides astonishing insights for a solution that could create abundance for all people. This is a must read if you want to survive the global monetary transformation that’s under way right now. Please contact the author if you are interest in writing a review.